Traditionally known for their digging prowess, compact excavators have become a valuable addition to every equipment lineup. 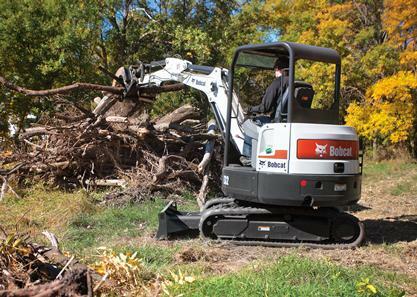 And when it comes to work, these attachment options make Bobcat® compact excavators the go-to choice for tough jobs that require versatility and efficiency. Combined with a trenching bucket or three-tine grapple, clamps give you the ability to selectively grab and move heavy objects, making them especially effective for debris cleanup or precise placement of building materials. Perfect for digging narrow, deep trenches, these buckets are the ideal choice for water, power and telecommunications, or sewer and drainage projects. Hydraulic breakers save you time and effort with their quick, efficient method of busting concrete and asphalt. Plate compactor attachments offer more power and increased reach over hand-operated compactors, while eliminating the need for workers to be in the trench. Ideal for property maintenance, roadside clearing and land clearing, a flail mower exploits the reach and maneuverability of a compact excavator. A popular choice for finish work, a grading bucket is ideal for adding contours in drainage applications, finish grading, cleaning ditches, backfilling and leveling. Trenching attachments give a reliable, cost-effective way to cut through tough trenching work in confined areas.